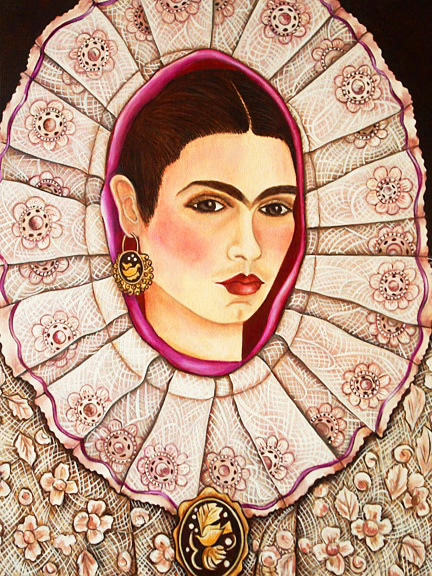 Do you have a Frida Idea? I have have such admiration for Frida and her life story. There are so many people that love her and many collectors of anything Frida Kahlo, that I decided to do a series as a homage to her. I have 6 older paintings already but will hopefully be able to build a series of 100 Frida paintings based on her life. This painting touched me and has a lot of meaning to my life as well. 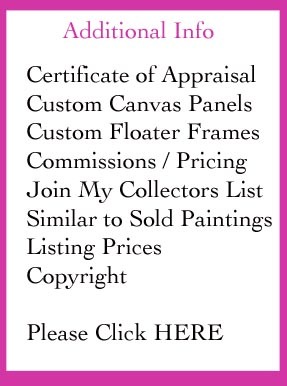 I had years of recovery from a serious accident and lost the use of my painting arm for many years along with several other injuries and disabilities left from it. When I read about what she faced in her very short life I feel blessed and inspired. 1948 - Frida painted two self-portrait’s in which she appears wearing the traditional Tehuana headdress. In Frida’s painting she has a look of pain and tears on her face. I don’t like to paint sad emotions so I painted her as I would see her in this headdress, more beautiful and peaceful. I loved that she wore a medallion with a dove figure. The Dove is generally thought to be a symbol of freedom. Birds can walk on the earth and swim in the sea as humans do but they also have the ability to soar into the sky. Birds are free to roam to earth and the sky. Many cultures believe that they are a symbol of eternal life, the link between heaven and earth. I wonder if maybe her medallion represents her feelings in this quote. With all of her pain and adversities she still faces life with a gentle positive spirit. Is this the spirit of the Dove? The freedom and the ability to walk through life with bravery. Is this her link between Heaven and Earth? Eternity?